Whether we accept the specifics of the miyadaiku’s explanation or not, the metaphor of harmony between the materials and the work of art is a powerful one. Indeed, although this story might seem quaint and old-fashioned, we can use it to explain the situation in the most high-tech of contemporary fields: computer art. With a very few exceptions, all of today’s computer art represents a collaboration between an artist and an engineer. The artist has the conception, but it is the engineer who understands the materials-the hardware and software-needed to realize this conception. This is very far from the harmony envisioned by the miyadaiku between conception and realization, materials and design. In fact, in today’s computer art, the artist assumes the role of the creative genius while the engineer settles for the subordinate role of manual laborer. Although such collaborations can produce respectable artwork, they rarely lead to works of real power and inspiration. What is more, the situation is getting worse because relentless progress in information technology has widened the gap between artist and engineer: The artist has little understanding of the computer as a medium, and the engineer (who has no artistic training) is not allowed to unlock his creative potential in using the medium he has mastered. How can we heal this split and unleash the deep creative power that is inherent in the new medium? I think the answer lies in re-engineering our teaching so that the same person can be a fully formed computer artist-both conceptualizer and engineer in one person. Not that I think this will be an easy process. Actually, today it is still a very difficult process, and one that can only be accomplished after significant trial and error, as my own career demonstrates. Being proficient at both art and mathematics, I found it difficult to choose a major when I arrived as an undergraduate at MIT in 1984. However, as the dutiful son of a practical-minded father, who told me I would never make a living drawing “pretty pictures,” I naturally chose the very practical and employable discipline of electrical engineering and computer science. I continued to pursue design as a hobby, and I would often venture into the various technology/art venues on campus seeking an undergraduate research fellowship that would combine my interests. However, the majority offered not an opportunity to achieve mastery in the arts, but instead a chance to fill the need of many artists for fluent technologists who would help develop incremental improvements in their efforts. My true salvation was the Rotch Library on campus, which houses a rich collection of examples of graphic arts, where I could delve into generations of “real” artists and see a depth to their craft that I could not find on campus. I persevered in my “practical” study of engineering until I had earned my master’s degree. At that point, my father startled me by declaring that I was now a man and was free to pursue my own interests. Liberated by his permission, I immediately left for Japan to study graphic arts in the traditional way. In 1990 I entered the Institute of Art and Design at Tsukuba University. Tsukuba was a Bauhaus-influenced arts and design school with very few computers (there was only one Macintosh on hand), and I was suddenly free from the daily e-mail grind. The absence of high technology was very calming, as was the traditional atmosphere. I experienced a sense of gratitude for being able to think with my hands in harmony with my mind. I had been taught to honor tradition from an early age, and so the didactic ways of art school suited me very well; I was pleased to steep myself in the graphic traditions of the Japanese masters in such arts as typography, fine printing and sculpture. Around the time I was completing my studies at Tsukuba, however, I got a surprise not unlike the one I had received from my father on getting my master’s degree. My very traditional-minded instructor in typography, Professor Kiyoshi Nishikawa, pulled me aside and advised me to stop studying the classics. “Do something young,” he said. “The classics will never change; they will be there to honor when you are old.” The time to make a significant contribution to the design of our times is now, he told me. Liberated again, I returned to the computer, and, after the traditional discipline I had experienced for four years at Tsukuba, I was amazed by the feats I was capable of. I could make lines that move, change color and stretch in all directions; I could make a million lines, duplicate them twicefold and delete all of them in a single command stroke. When I was at MIT, this was all a very natural thing to do at the computer; however, having been away from computers in a very different environment, I had become so accustomed to a rule and pen that I was bewildered by the possibilities posed by the computer. I had a new sense of respect for the potential of the medium and set out to explore the expressive gamut, creating a series of images for my first exhibition “Design Machines”. The images exercised the computer’s ability to create complex imagery. 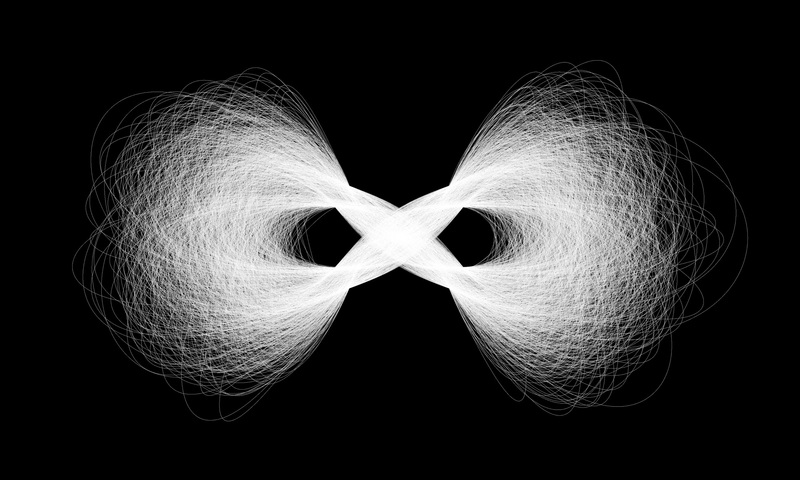 In the development of my key image, I was interested in enscribing an image of “infinity” as a series of loops that never terminate, and created a self-terminating shape of linked splines. Reviewing my work, Dr. Edward David (former science advisor to President Richard Nixon and a person with close ties to MIT) referred me to work created in a similar spirit during the 1960s at Bell Laboratories, the birthplace of computer art. I discovered that many of my techniques, such as making pictures out of small pictures, endless textures of lines and noise-based images, had already been used by the pioneers at Bell Labs. At first I was discouraged and considered early retirement from the field, returning to studying the classics. However, after many hours of staring at work by my predecessors, I realized that although the concepts employed were similar in spirit, there was considerable room for improvement. It was as if a visual sleight of hand had been performed, but the trick had not been perfected. The computer had simply been used as a substitute for paint brush and paper, rather than being explored as a medium in its own right. As a result, there had been no opportunity for technologists to develop into true digital artists. With this conclusion, I set out to develop myself as a true artist-engineer, with the computer as my medium. And I also have dedicated myself to nurturing a generation of people with this same potential as both engineers and artists. In my own creative work, I pursue this art form both in print and in the digital displays on the computer screen. In print, I search for the simplest means for realizing visual complexities that carry an orderly theme; in digital, I spin complex weaves of temporal graphics that appear simple because all of the details have been hidden along the axis of time. Five years ago, I began to create a mixture of print/digital work that emerged as a popular series called “Reactive Books.” In this endeavor, I focused on developing not just “interactive” media, but “reactive” media, where the interaction hits at a more sensorial level. When I showed this work to the late designer Paul Rand (a master best known for designing the IBM logo), his wise response was: “This is all quite beautiful work…but how are you ever going to make any money doing this?” I found this odd coming from a designer. In fact, I felt I was back to square one-my father’s earliest advice. But Rand wasn’t referring to an artistic career in general but specifically to the fact that there was no market for the kind of work I was doing. Nobody was about to buy a floppy or CD-ROM to look at one of my dynamic pieces because it was simply too inconvenient and expensive. The answer to this dilemma came with the birth of the World Wide Web and the emergence of the JAVA programming language. With those two developments, possessing a mixture of graphics and computational skills began to achieve commercial relevance. One client stepped forward before all others, an art director at Shiseido Cosmetics, Michio Iwaki. In the 1960s, Mr. Iwaki had experimented with computer art while he was in design school, but his fellow students made fun of him for “not being able to use a regular pen.” He gave up mixing design and computation, but swore to support the effort one day. This developing combination of graphic arts and engineering skills, along with my gratitude to teachers at MIT, brought me back to Cambridge two years ago to help instill these principles in a generation of young digital artists. I had been recruited to resurrect the Media Lab’s waning presence in computationally motivated graphic design, which only several years before achieved international recognition for ideas and practices initiated over decades at the lab’s Visible Language Workshop (VLW) by the late Professor Muriel Cooper. Today at the Media Lab, my research group is called the “Aesthetics and Computation Group,” and we are devoted to combining analytic and expressive skills in singular expressions of will and technology. I very much enjoy what I am doing with my group of young artist-engineers. But I believe that these same principles must be applied much more widely, throughout MIT and indeed throughout our university system in general. At least at MIT, there has been for many years an awareness of the need for combining the humanities and sciences at the curriculum level. Despite the best of intentions, however, the model of training is this area remains some form of the humanities wrapped around technology, or vice-versa. But we must go far beyond this initial model. It is not enough for us simply to produce a technologist who is aware of the cultural context of technology or a humanities major who can talk fluently about technology. No. What is needed is a true melding of the artistic sensibility with that of the engineer in a single person. Although this task will not be easy, I have an idea of how it could be done. What is needed is an initiative at MIT-and at other universities-that combines the skills imparted in basic engineering courses with those found in humanities classes. For example, here at MIT one of the largest undergraduate courses is the introduction to computer programming (known as 6.001, because it is the first step in “Course VI,” which is the electrical engineering and computer science major). The spirit of 6.001 needs to be combined with some of the basic humanities courses, such as art history or beginning photography. In this context, the prejudices of both sides-engineering and humanities-could be relaxed, and students would be able to begin to combine the core principles of both disciplines. This may seem like an abstract, even quixotic idea, but at the Media Laboratory, I have begun to teach courses in this manner-and it works. In these courses, gifted young engineers and scientists are beginning to stir their creative talents as the designers and artists of the next century. But we will see this next generation of art and artists only by gaining a deeper understanding of, and appreciation for, the medium of computing as a means of serving human expression.